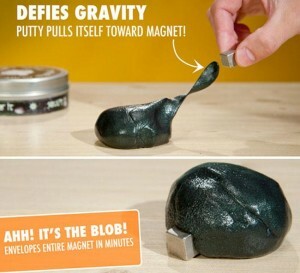 Magnetic Thinking Putty – The new Silly Putty is just silly! Remember Silly putty when you were a kid? Well we are not blind to technology upgrading just about anything around us. So silly putty has got its fair share of upgrades too. Meet the all new “Magnetic Thinking Putty”! This next generation of silly putty has millions of tiny micron sized magnets embedded into it. These millions of minute magnets make it into a blob that feeds on magnets. You will get a better idea when you watch the video. It does possess the initial properties of the first generation silly putty allowing you to stretch it, bounce it, mold it and tear it. You can buy the new Magnetic Thinking Putty from VAT19 for $13.50. It will make a scary monster or a great sci-fi movie addition. Ah, good ‘ol childhood! Have fun! Forget Bullet proof vests, now its Bullet-Proof T-Shirts!!! Next Gasoline made from CO2 soon!